Autoimmune retinopathy (AIR) is a rare but potentially blinding condition that is often underdiagnosed. Common features in AIR presentation include rapidly progressive vision loss with abnormal electrophysiological responses of the retina associated with positive anti-retinal antibodies. AIR is also challenging to treat, and thus, the introduction of new potential therapeutic agents is welcomed. 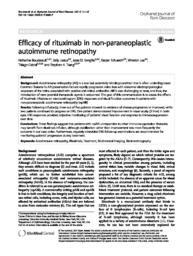 The goal of this communication is to assess the effects of rituximab infusions on electroretinogram (ERG) responses and visual function outcomes in patients with non-paraneoplastic autoimmune retinopathy (npAIR). Following infusion(s), three out of five patients showed no evidence of disease progression or improved, while two patients continued to progress on ERG. One patient demonstrated improvement in visual acuity (2 lines) in both eyes. ERG responses provided objective monitoring of patients’ visual function and response to immunosuppression over time. These findings suggest that patients with npAIR unresponsive to other immunosuppression therapies may benefit from rituximab infusion, although stabilization rather than improvement was more frequently the outcome in our case series. Furthermore, regularly scheduled ERG follow-up examinations are recommended for monitoring patients’ progression during treatment.